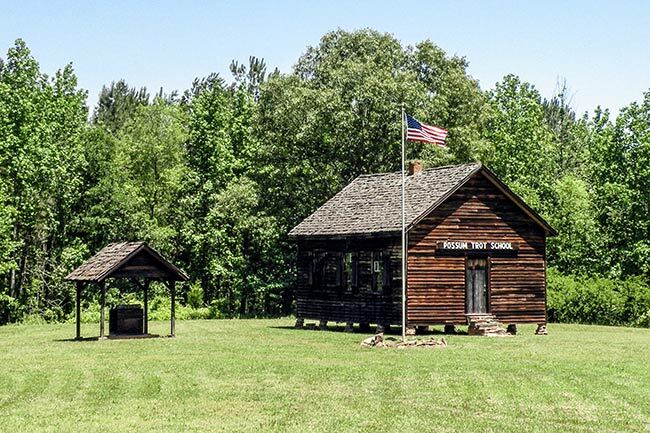 The Possum Trot School is located in the small upstate town of Gaffney. It was built in 1880 and is one of the few remaining one-room schools in South Carolina. The school was originally located on farmland in the Midway Community just outside Gaffney. It was constructed by brothers Jimmy and Tom Pettit (with the help from other Cherokee County residents) and went through 11th grade. 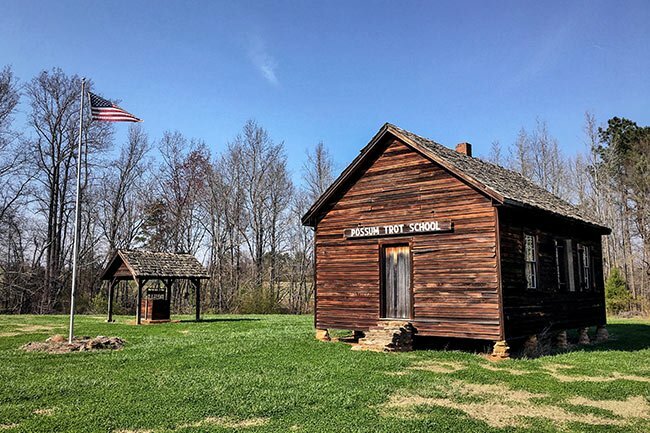 The name “Possum Trot” most likely comes from the fact that students reached the school by following an already existing possum trail through the nearby woods. With the construction of newer, larger schools, Possum Trot School was abandoned and eventually fell into disrepair. In 1969, Louise Phifer Camp hired local builder Ernest Wyatt to restore the schoolhouse as a gift for her husband Bill Camp, a Gaffney native who attended the school with his siblings. Although the school had greatly deteriorated over the years, its foundation was still intact, which made it possible for Wyatt to restore the building to its original measurements. Due to a property transfer in 1992, the school had to be moved to its current location next to Hamrick’s department store on Peachoid Road. It now sits just a half-mile from the famous Gaffney Peachoid. Special thanks to the Cherokee Historical and Preservation Society for sharing the history of the schoolhouse. We have never seen this photo but would love to! We will search online and will let you know if we come across anything. If you happen to find it before we do, could you let us know either here or via email at share@scpictureproject.org? Thank you! As a child back in the 60s I believe, myself and a group of other African-American children had a picture taken in front of the school with the wife of the POTUS at that time. I’m trying to find a copy of that picture, can you assist? Do they ever open the school to the public? We noticed it is furnished. Ask the Cherokee Preservation Society if you can photograph the inside. The group’s website is linked in the page above. Good luck! Is there a way I could take photos on the inside of the school? I would like to see pictures of the inside and know some of what they learn. Do they learn the same things as I do? I would like to learn Possum Trots history and to photograph it. Is that possible?